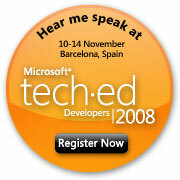 At the moment I only have one fall speaking commitment settled and it’s one of my favourites - Tech Ed Developers Europe. Barcelona will be warm, both in the temperature sense and the personal interaction sense (though I do predict exposure to pocket-picking, bag-lifting, and other forms of theft once again). The attendees will be energetic and appreciative. The other speakers will be fun to hang around with. The ancillary events will be fun fun fun. My topics are the Vista Bridge, and some new C++ features. We’re still working on the abstracts and titles, so I’ll post an update when they’re locked.